I decided to use the traditional colors of Daffodil Delight, Wild Wasabi, Basic Black and Whisper White for my lemon creation. The saying from the stamp set created for a fun background that is adhered on to a piece of our Thick Whisper White card stock. I keep kicking myself, why did I not get on the thick white card stock band wagon earlier!?! I LOVE this stuff for card bases! 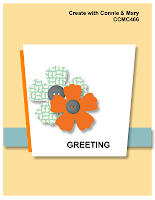 I also added in the stars and main greeting from the Tabs For Everything set for a bit of whimsy. Hope you're enjoying your week! Happy Stamping! I totally see the glass shape now that you mention it! What a fun, fresh (and refreshing) theme! Your signature repeated pattern background is cool, as usual!